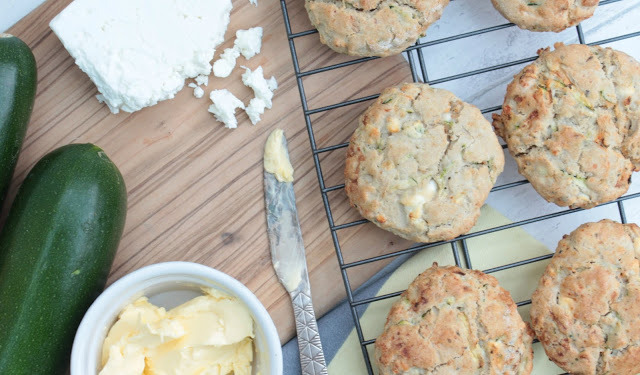 These gluten free feta and courgette scones are a great snack or light lunch whether you need a gluten free diet or not. You may have read that last week that I visited River Cottage HQ for a fantastic festive feast. Unfortunately I didn't get to speak to the lovely Vicki from Free From Fairy but on my way out I was lucky enough to pick up some of her flour that she had left behind. Free from baking is something I would like to try more of, and after the success of these scones I am going to give some more recipes a go. I used Vicki's perfect gluten free scone recipe as the base to this recipe, as I have only made scones once before and never gluten free ones! I was concerned that being gluten free they would have a different texture, but I am pleased to say that they were really good. The feta really comes through in the flavour and the courgette helps keep them moist. This recipe makes around 14 scones, depending on the size of your cutter. Mix the flour, baking powder and butter together. Add the milk to make a soft dough. Grate the courgette and squeeze out as much water as possible using kitchen towel. Add the courgette, feta, paprika and mint to the dough. Roll out the dough and cut out your scones. Brush with milk and bake until golden brown. They are great eaten with butter or alongside soup. You can purchase Free From Fairy Flour from Amazon or in bigger quantities from The Free From Fairy. Vicky has not asked me to blog about her flour, but as I was impressed with it I wanted to let you all know!